It may have taken longer than they would have liked, but Friday the Jaguars finally landed a deal for their first-round pick. The team came to terms after a 12-day holdout with first-round draft pick Eugene Monroe. The amazing thing was about an hour after Monroe ended the holdout by signing a five-year, $25 million contract that included $19 million guaranteed, the eighth overall pick was on the field, in the huddle and lining up against Jacksonville’s top defenders. 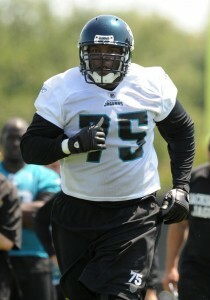 Monroe, a 6-foot-5, 325-pound left tackle from Virginia, responded by winning two of three one-on-one battles against fellow rookie Julius Williams. A few minutes later, coach Jack Del Rio called for Monroe to go against veteran James Wyche in the “Oklahoma drill.” That matchup was a beatdown. For nearly two weeks, it looked like Monroe would be a no-show during camp. The Jags have big plans for Monroe, and the big thing for the big man is for him to now get up to speed with things and start being out there beating his fellow players on a consistent basis. “I feel he’ll have a bright future as a Jaguar,” general manager Gene Smith said. “He’s a quick study. I know he’ll come in and compete and do whatever it takes to get prepared to compete to be a starter. … It was nice to see him get out there and compete against a couple of our defensive linemen.